For my holiday party this year, I served six pizzas. It may seem daunting. But it really is so easy and here is how… I used my basic pizza dough recipe which produces dough for two pizzas and I planned on a couple different topping combinations. See white pizza and caramelized onion and gruyere pizza, I doubled these to make two pizzas of each. Make all the dough in the days before the party. Portion it into dough balls for each pizza and freeze it for a few hours to stop the rise. Then store the dough in the fridge. Prepare all your sauces and toppings (caramelized onions, bacon, white sauce) in the days before the party so you can throw them together quickly the day of. 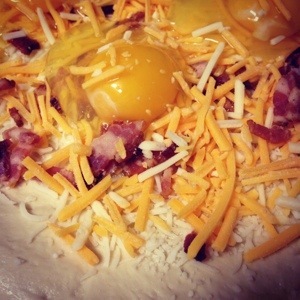 The day of the party, roll out the dough into pizza rounds between sheets of parchment. Keep these in the fridge until you are ready to bake. Heat the oven with pizza stone in place to 500 degrees. If you don’t have a pizza stone, use a baking sheet. Remove the top sheet of parchment from the pizzas, leaving the underneath parchment for easy oven transfers via a baking sheet turned upside down or a pizza peel. Spread your sauce over each pizza and add your toppings. I put the toppings on two pizzas at a time but baked them one by one. Bake for 10-12 minutes. I was not particularly sure how many people would come to the party so I actually made dough for 8 pizzas. Which is the other reason why this food plan is so great, it is easily adjustable. You told your ditzy friend to bring chips and dip? Oh they forgot… Luckily you can make an extra pizza. I suggest you always make more pizza dough than you need, it really keeps well in the freezer or fridge. 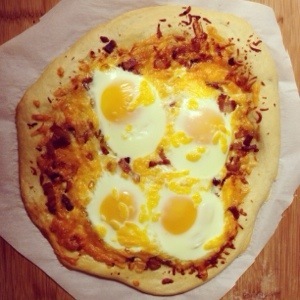 And to soothe your holiday party woes in the morning, you can make this breakfast pizza. You definitely don’t need a special occasion though to make this amazing pizza. The toppings are really quite flexible. I created this classic version but I suggest you use whatever is in your fridge: spinach, bell peppers, onions, caramelized onions, sausage, and any kind of cheese that sounds good to you. Choosing your own ingredients can be intimidating. But once you make this pizza by the recipe, you will be inspired to create your own combinations. 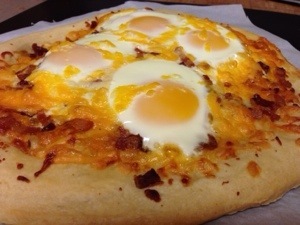 I do not use a pizza stone for this simply because of the runny eggs, they would make a huge mess. Using a rolling pin, roll out your pizza dough between 2 sheets of parchment to a 10 inch circle. Remove the top layer of parchment and place the pizza dough round on a baking sheet. Sprinkle cheddar cheese, red pepper flakes, and black pepper over the pizza dough. 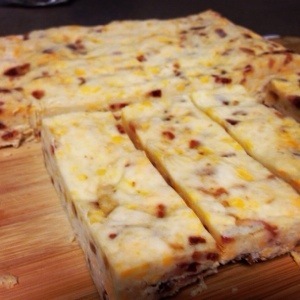 Evenly distribute the bacon slices, top with mozzarella cheese. 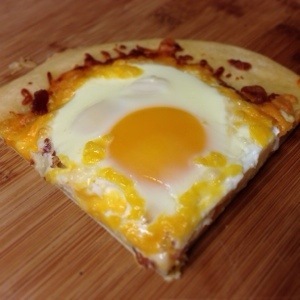 Crack each egg in one quadrant of the pizza. 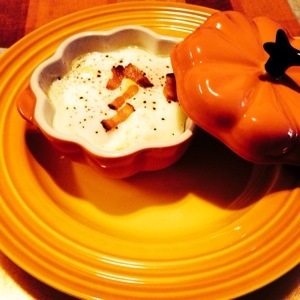 Bake in the oven for 20-25 minutes, this produces fully cooked eggs. 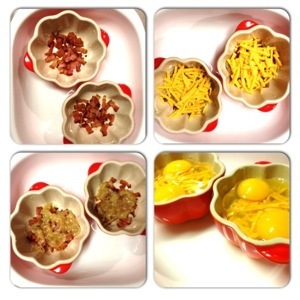 Adjust your baking times if you would like softer eggs. Scones? Yes. Bacon? Yes. Cheese? Yes. If you are having guests in town and need an easy breakfast, this is your recipe. These scones keep extremely well in the freezer. You can pull out as many as you need and have breakfast ready in 25 minutes. Cut the cold butter into 1/4 inch pieces. Dice the bacon into very small pieces, less than 1/4 inch. Stir together the all purpose flour and cake flour in the bowl of a stand mixer with the paddle attachment. Stir in the baking powder, baking soda, sugar, and salt, and mix until combined. Mix in the butter on a low speed for 3 minutes. You should have fine pieces of butter with no large chunks. With the mixer on low speed, pour in the cream in a steady slow stream. Mix in the sour cream for 30 seconds. The dough will start to come together around the paddle now. 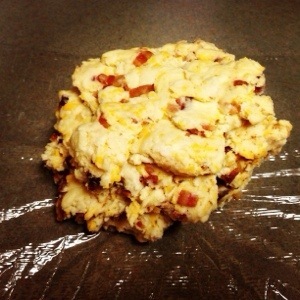 Mix in the bacon and cheddar cheese. 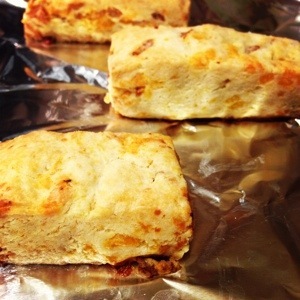 Shape the dough into a rectangle, planning to cut the scones into whatever shape you desire. 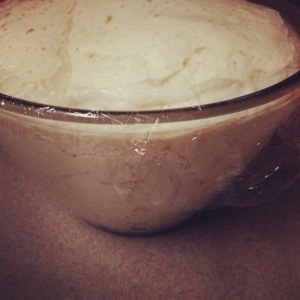 Wrap the dough in plastic wrap and place in the fridge for 3 hours. Cut the block of dough into your preferred shapes. You should end up with approximately 12 scones. Arrange them on a lined baking sheet, cover with plastic wrap. Freeze for 3 hours, preferably overnight. Preheat oven to 350 degrees. Arrange the scones on a parchment lined baking sheet. Bake for 25 to 27 minutes, rotating the pan once. When my husband and I registered for our wedding, he asked only for two things: an XBOX and a waffle maker because he loves waffles. In another effort to use up leftover buttermilk from cupcake baking, I thought I would use it in some waffles. 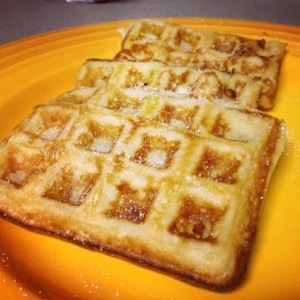 The basis for this recipe comes from the booklet that came with the cuisinart griddler waffle maker. These things are so light and fluffy and fabulous. 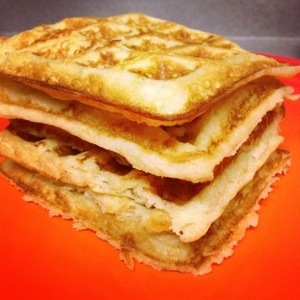 I made this full recipe and had a few extra waffles which I refrigerated. From the fridge to the toaster, they performed beautifully. And in 24 hours the extra waffles magically disappeared. Combine the flour, sugar, baking powder, baking soda, and salt in a large bowl. In a separate bowl, combine the buttermilk, melted butter, eggs, and vanilla. Stir the wet ingredients into the dry ingredients. Do not over mix or they will not turn out so fabulously fluffy. Preheat your waffle iron as directed on the instructions. Spray the waffle iron with nonstick spray or butter. Cook for 2 or 3 minutes, check the first one to make sure it is done. I always seem to have buttermilk in my fridge that is nearing expiration. Buttermilk is part of most of my cupcake recipes. 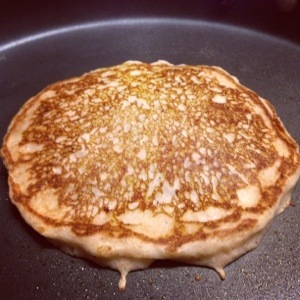 So to use up the leftover I tried this from scratch pancake recipe. This is super simple to whip up in the morning. I don’t think I will be buying pancake mix ever again. I work a lot of nights which means my husband eats a lot of brinner. Lets just say he does not complain when he gets to eat these chocolate chip pancakes for dinner. In a large bowl, combine the flours, sugar, baking powder, baking soda, salt. In a separate bowl, whisk together the buttermilk, eggs, melted butter, and vanilla. Add the wet ingredients to the dry ingredients. Mix just until combined. Do not over mix or the pancakes will be heavy. Heat a nonstick frying pan over medium. The pan is ready when water sizzles immediately when it contacts the skillet. sing a half cup measuring cup or an ice cream scoop, scoop the batter onto the pan. 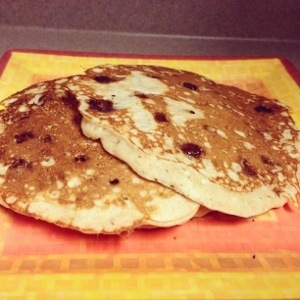 Sprinkle the pancake with chocolate chips. Cook for 1-2 minutes or until the edges look slightly done. Flip and cook one minute more. 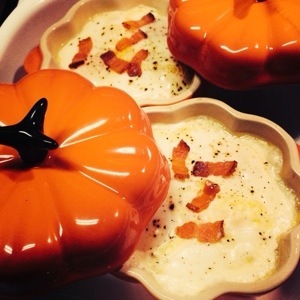 This recipe is adapted from Kitchen Treaty.